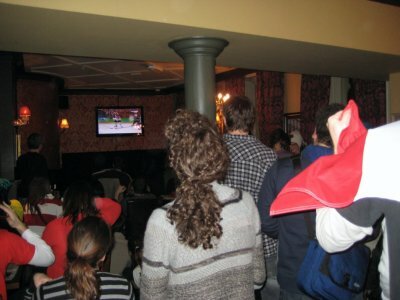 Watching the Winter Olympic Hockey final on February 28, 2010 at the Albion on New Bridge Street in London. The game was Canada vs. USA. Canada wins 3-2 in overtime. 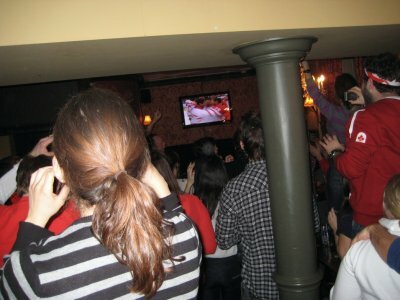 The pub is owned by a Canadian, and so they showed all the hockey games. Eight years ago, I was sitting on a counter having an internal debate. I was in Air Canada Elite lounge in Terminal 2 of Lester B. Pearson International Airport in Toronto. Access to the lounge is a benefit of being an Elite flyer, and includes comfortable chairs, free alcohol and big screen TVs. The date was Sunday, February 24th, 2002, and I was about to get on a flight down to St. Louis for work. The debate I was having was whether or not I would get on that flight. That Sunday was the final game in the Men's Olympic hockey tournament in Salt Lake City. Canada was playing the USA. My flight was scheduled in the late evening. I had showed up very early for my flight to make sure I could see the game. In close to the end of the second period, and Brian Rafalski had just scored a goal for the USA to tie the game up at 2-2. The game was tight, and I suddenly was hit with the realisation that if the game stayed close, it could go into overtime. If the game wrapped up in regular time, I'd be able to see it all, but if it went to overtime, I'd either have to leave to catch my flight or blow off the flight and keep watching the game. Luckily, I never had to make that choice. Canada scored with less than 2 minutes left in the second period, and then went on to put away another two goals in the 3rd period to win 5-2. Between you and me, though, I would have blown off the flight and watched the game. Some things are more important than work. Last Sunday (February 21st), I sacrificed work again by staying up really late to watch Canada and the USA play Olympic Hockey again. It was the round-robin part of the tourney, and Canada and the USA were both undefeated. The winner would move on to the quarter finals. The loser would have to play an elimination game before getting to the quarter finals. I headed down to The Albion on New Bridge Street. 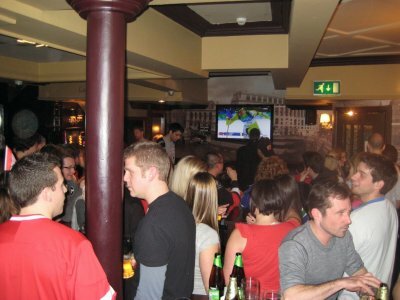 The pub is owned by a Canadian, and so he got a late licensed to stay open for all the games. 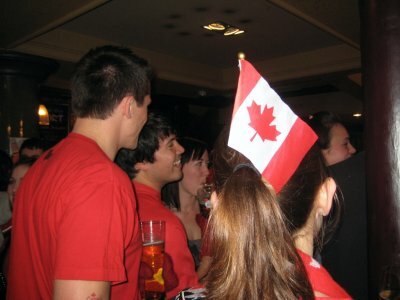 As the Olympics were in Vancouver, which is 8 hours difference from London, most of the games started very late. That Sunday, the game started after midnight. It wasn't a great game, as a Canadian fan. Canada lost 5-3, setting up a long road to get to the final. It stung to have stayed up so late and not get the benefit of seeing a Canadian win. Over the next week, Canada played three more games, winning against Germany, Russia (one of the favourites in the tournament) and Slovakia and winning them all to set up a final against the team they'd lost to the last Sunday - The United States of America. 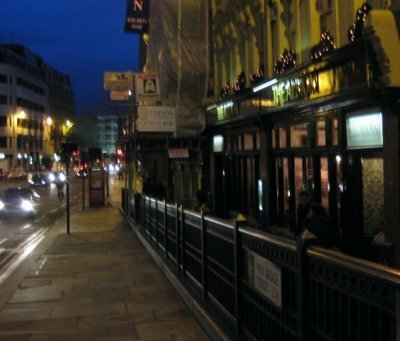 I head down to the Albion again for the game. Judging by the crowd there the previous Sunday, I figured I should show up earlier. I showed up at 6 PM, two and a quarter hours before the game. I was one of the last people allowed in before the bar was packed and no others were let in. Canada was up 2-1 until the dying minutes of the game, when the USA scored and sent the game to overtime. The crowd, almost all Canadians, were stunned into silence. Luckily for the crowd, Sydney Crosby scored in overtime to win 3-2. The crowd went wild. People who didn't know each other were hugging. Everyone was smiling. A few folks even broke out the champagne. Congratulations to Canada! Always nice watching these things with other folks of your nationality. Come June, though, I'll have to adopt another country to be part of. Canada didn't make it into the World Cup. A few folks even broke out the champagne. That would have been you then Greg?! A great game it was indeed! Canada did great this Olympics and coming out number one in the medal tally must have been a nice reward. Well, number one in terms of how they count in Europe, in the US I guess you came in second as they count total medals vs. just the golds. How does Canada do the medal tallying? 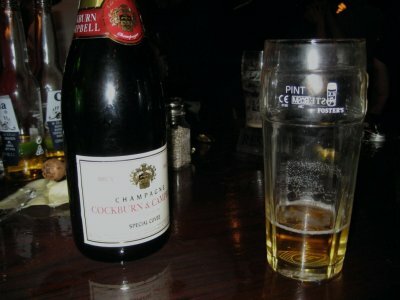 No champers for me. I had my fill of beer. In Canada we count total medals, so Canada was 3rd with 26 medals. In Europe, they count golds, so Canada was 1st. Either way, a very successful Olympics for us, especially considering the past two times we hosted (Montreal in 1976 and Calgary in 1988) we won a total of 0 Gold Medals. The only country to do that TWICE! Ah, so it's a North American thing then I guess. Norway came in 4th on both counts, though equal Golds to the US which is rather impressive for a country with only 4.5 million residents It was that Gold in the curling that we lost to Canada that stung especially, hehehe. Definitely a great Olympics for Canada on the medals front! !